VR23 is a small molecule that potently inhibited the activities of trypsin-like proteasomes (IC50 = 1 nM), chymotrypsin-like proteasomes (IC50 = 50-100 nM), and caspase-like proteasomes (IC50 = 3uM). Epoxomicin is a potent anti-tumor agent isolated from Actinomycetes that is used as a selective and irreversible inhibitor of the 20S proteasome. 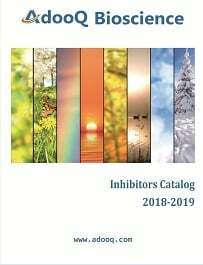 AM 114, a derivative of boronic chalcone, is a potent small-molecule inhibitor of the proteasome that inhibits the chymotrypsin-like activity of the 20S proteasome, with a value of 50% inhibition concentration IC50 of approximately 1 uM, resulting in a significant accumulation of ubiquitinated p53 and other cellular proteins in whole cells without significantly disrupting the interaction of p53 and murine double minute 2 (mdm2) proteins. Marizomib is a naturally-occurring salinosporamide, isolated from the marine actinomycete Salinospora tropica, with potential antineoplastic activity. Aclarubicin A, an anthracycline drug, specific inhibitor of the 20S proteasome chymotrypsin-like activity. Dihydroeponemycin is an inhibitor of proteasome and antitumor reagent. Clasto-lactacystin b-lactone was later identified as the active metabolite of lactacystin, resulting from the elimination of cysteine and the formation of a reactive b-lactone. MG-115 is a potent, reversible peptide aldehyde inhibitor of proteasome chymotrypsin-like and caspase-like activities. It induces p53 dependent apoptosis. ONX 0912 is a tripeptide epoxyketone, which inhibits growth and induces apoptosis in MM cells resistant to conventional and bortezomib therapies. PSI is a proteasome inhibitor that inhibits chymotrypsin-like activity of the proteasome. MG-132 is a potent cell-permeable inhibitor of proteasome (IC50 = 100 nM) and calpain (IC50 = 1.2 μM). MLN2238 is a potent reversible and specific β5 site of the 20S proteasome inhibitor with an IC50 value of 3.4 nM. CEP-18770 is a novel orally active proteasome inhibitor with a favorable tumor selectivity profile for the treatment of MM and other malignancies responsive to proteasome inhibition. PR-171 (Carfilzomib) is a tetrapeptide epoxyketone and a selective proteasome inhibitor. It is an analog of epoxomicin. ONX 0914 is an immunoproteasome inhibitor with potential treatment applications in autoimmune disorders, such as rheumatoid arthritis, inflammatory bowel disease and lupus. ONX 0914 was designed to be a potent inhibitor of the immunoproteasome with minimal cross-reactivity for the constitutive proteasome. Lactacystin is a cell-permeable, potent and selective proteasome inhibitor. Gliotoxin is an immunosuppressive mycotoxin produced by pathogenic strains of Aspergillus and other fungi. MG-262, a boronic peptide acid, is a potent proteasome inhibitor that selectively and reversibly inhibits the chymotryptic activity of the proteasome.